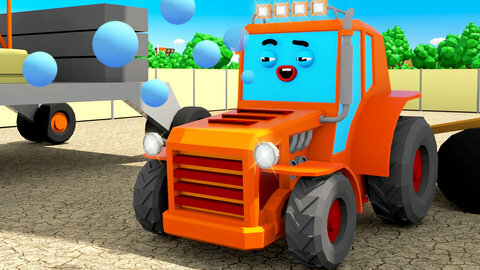 The Orange Tractor is playing with bubbles in this video for children when the Police car accidentally bumps it from behind. He accidentally swallowed the bubble solution and was able to create huge bubbles with its mouth. The bubble got caught in the wind and brought the tractor to the lake and construction site where he helped the Yellow Excavator. Watch more of their adventures for free by going to SeeZisKids.com.